This weekend was my in-laws 40th wedding anniversary. Amazing! We were trying to coordinate something, but she had already sent out an evite for their party. My mother-in-law is all about the party. She threw herself a Quinces x 4 (Sweet 16's, but at 15 years old) for ﻿her 60th Birthday. I'm talking tiara, cape, and big ball gown skirt. It was hilarious. So back to this weekend, my sister-in-law and I decided to work on the decorations for the party as a surprise to my in-laws. She was in charge of the cake and framing some old picture in black frames that we spread out on the tables. I did the centerpieces. We decided to go with a black, white, and red theme. Here is what I came up with. I bought 12 dozen roses for 6 vases that I had from my wedding. I glued a black ribbon to the center of the vase and made a little monogram on my computer. Very simple and super pretty. I am by no means a florist, but I think they came out really pretty. My mother-in-law actually teared up when she saw what we had done. That made it all worth it. She gives so much to us. On another note, I found out last night that I won a Homegoods gift card giveaway from Domestic Jenny. I am so excited. I was in a bit of a grouchy mood and she totally made me smile. I can't wait to go shopping. 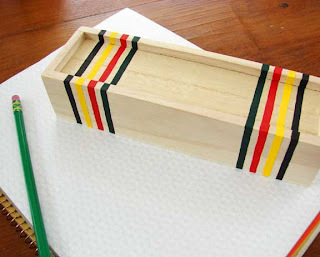 Jenny's blog has been one of my favorite finds. She has beautiful taste and is quite the DIYer (?). I'm talking sketches, plans, step by step directions. You have to check it out. Thanks Jenny! I love the simplicity of the flower arrangements. 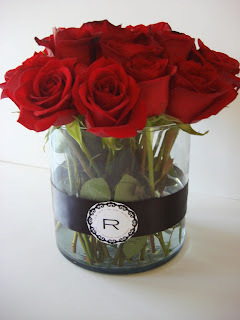 The glass containers showcase the beauty of those bright red roses! I'm throwing a 40th anniversary for my parents in May and I'm doing something similar. Looks great! Those centerpieces are stunning! Great job (wedding side business?? ha ha). Awesome prizes, congrats! It's SO fun to win! 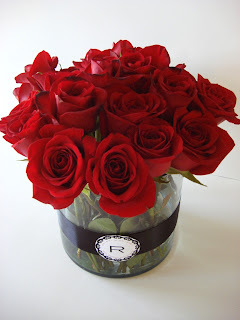 That is beautiful, I love the ribbon and monogram on the vase. Those are so beautiful! Love the monogram!